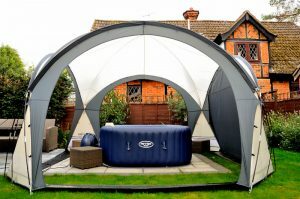 WickedTubs hire inflatable hot tubs. Based in Hemel Hempstead, we deliver and set-up an amazing hot tub ready for you to enjoy. We deliver free within a 15 mile radius and leave you with everything you need. Great for warm summer evenings, but even better for chilly nights – there’s nothing better than dipping into hot bubbles when the air is cold outside! We also have gazebos, which protect you from the elements and provide privacy on all sides if necessary. Just put on some music and enjoy the experience. Perfect for a romantic night with a loved one, catching up with friends or a splash party for kids, we provide 2 sizes of Lay-Z-Spa hot tub, which is ideal for up to 4-5 people or 6-7 people.. All in the comfort of your own garden. Every tub is emptied, disassembled, removed and cleaned by us after every use by customers. We’re a young company and keen to impress! Message now to let us know your requirements!